Many people that live in Wisconsin can figure out that our state song is, of course, "On Wisconsin," or can guess that the state beverage is milk. But how many people know about our state mineral (Galena) or state tree (Sugar Maple)? Not many. Show your smarts and impress your friends by learning all of Wisconsin's state symbols. State Song: "On Wisconsin!" While it had long been a crowd-rousing song at UW-Madison football games, "On Wisconsin" became the official state song in 1959. State Flower: Wood Violet. Adopted as Wisconsin's official state flower on Arbor Day 1909, this flower was actually voted in by school children. Not only is it the state flower for Wisconsin, but it also holds this title in Illinois, New Jersey, and Rhode Island. State Bird: Robin. Another symbol chosen by Wisconsin's school children, the red-breasted robin was named as the state bird in 1926-27. State Tree: Sugar Maple. First chosen in 1893 -- again by school children -- the sugar maple became the "official" state tree in 1949. State Fish: Muskellunge. The muskie became Wisconsin's state fish in 1955, although fishermen have been battling them for centuries. These monster fish can grow up to five feet in length, though fish stories have them reaching up to seven feet. State Animal: Badger. Wisconsin earned its nickname from lead miners who lived in hillside caves during winter months that were termed "badger dens." Since then, the badger has come a long way, eventually earning state animal status in 1957. State Wildlife Animal: White-tailed Deer. Deemed another important animal to the state of Wisconsin, it was decided the white-tailed deer should be honored as a state symbol as well. This graceful animal earned the designation of state wildlife animal in 1957. State Domesticated Animal: Dairy Cow. Dairy is an important industry in the state of Wisconsin, and it was only fitting that the dairy cow was named state domestic animal in 1971. State Mineral: Galena. Galena is an abundant and important source of lead, long mined in southern Wisconsin. It was named as the state mineral in 1971. State Rock: Red Granite. A very pretty igneous rock made up of a variety of minerals -- typically quartz, feldspar, mica, and hornblende, Red granite became the state rock in 1971. State Symbol of Peace: Mourning Dove. Also named to the list of state symbols in 1971, the mourning dove is a peaceful, very abundant and large bird well known by its prominent, repetitive cooing. State Insect: Honey bee. In 1977, a group of third grade students from Marinette named the honey bee as Wisconsin's state insect. State Soil: Antigo Silt Loam. This soil was a product of glaciers and enhanced by prehistoric forests. In 1983, Antigo silt loam was chosen to represent the more than 500 major soil types found in Wisconsin. State Fossil: Trilobite. It's hard to believe, but hundreds of millions of years ago, Wisconsin was the site of a warm, shallow salt sea. Trilobites were small arthropods that lived at this time, and today are popular among fossil collectors. They were named as state fossil in 1985. State Dog: American Water Spaniel. Lively and strong, the American water spaniel was voted in to the position of "top dog" in 1985 by the citizens of Wisconsin. State Beverage: Milk. With Wisconsin's abundant farmland, it's easy to understand why milk was named official state beverage in 1987. State Grain: Corn. Again in deference to our agricultural community, corn was named the official state grain in 1989. State Dance: Polka. This lively dance style was a gift from the European settlers of this region in the late 1800's. However, polka didn't become the official state dance until 1993. State Motto: "Forward." Adopted in 1851, this motto reflected Wisconsin's continuous drive to be a national leader. State Flag: Wisconsin's state flag consists of the State Coat of Arms (see below) on royal blue cloth, with the word Wisconsin centered above, and 1848 -- the year Wisconsin was admitted to the union -- centered below. 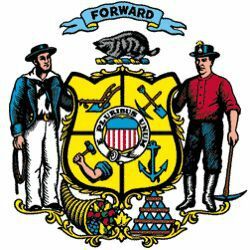 State Coat of Arms: Finalized in 1881, the Coat of Arms contains symbols that represent the diversity, wealth and abundance of resources in Wisconsin. The figures are a sailor with a coil of rope and a miner with a pick. These men support a quartered shield with symbols for agriculture (plow), mining (pick and shovel), manufacturing (arm and hammer), and navigation (anchor). Centered on the shield is a small U.S. coat of arms and the U.S. motto, E pluribus unum, "One out of many." At the base, a cornucopia, or horn of plenty, represents prosperity and abundance, while a pyramid of 13 lead ingots represents mineral wealth and the 13 original U.S. states. Centered over the shield is a badger, the state animal, and the state motto "Forward" appears on a banner above the badger.